Released to critical acclaim in both the East and the West, Cure was a breakthrough film for director Kiyoshi Kurosawa, a nerve shredding thriller about the hunt for a serial killer in a bleak and decaying Tokyo. A series of murders have been committed by ordinary people who claim to have had no control over their horrifying actions. Following the only link – a mysterious stranger who had brief contact with each perpetrator and their victim – detective Kenichi Takabe (Koji Yakusho, Tokyo Sonata, 13 Assassins) places his own sanity on the line as he tries to end the wave of inexplicable terror. Described as one of the greatest films of all time by Bong Joon-ho (The Host, Snowpiercer), Cure is a deeply unsettling masterpiece of its genre, and has shockingly been unavailable on home video in the UK until now. 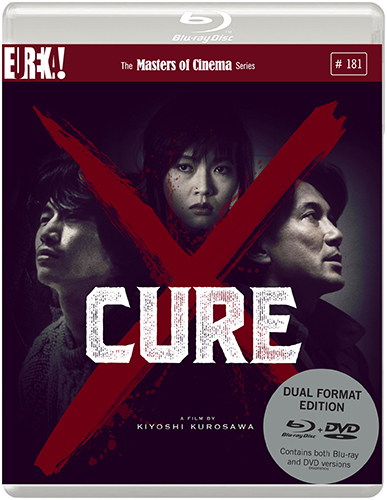 The Masters of Cinema Series is proud to present Cure in a special Dual Format edition.